The employment outlook for nurses looks very bright through 2024 for any student considering this helping profession. In today’s booming healthcare industry, nurses play a pivotal role in coordinating and providing high-quality patient care. Their daily duties range from recording medical histories and administering treatments to consulting with doctors and training new nursing staff. Nurses work at different levels based on their training. Licensed practical nurses (LPNs) provide the most basic medical care. 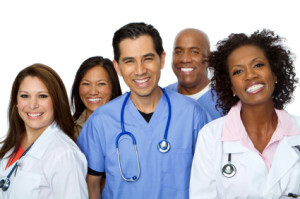 Registered nurses (RNs) have added patient responsibilities, typically in a specialized field. Advanced practice nurses (APRNs) take on leadership roles overseeing other nurses and often can prescribe medication. Healthcare facilities will be hiring nurses at all levels to meet the diverse medical needs of their patients. Overall demand in the nursing profession is expected to rise because America’s large baby boomer population is aging and requiring more medical treatment. Thanks to the Affordable Care Act, more people will also have access to health insurance for covering preventive care. The Bureau of Labor Statistics reports that the employment of LPNs will grow by 16 percent, thus creating 117,300 new jobs. Employment of RNs is projected to rise by 16 percent with 439,300 jobs added. Employment of APRNs will be highest with growth anticipated at 31 percent, which translates into 53,400 more jobs. High demand is particularly likely in medically underserved areas of inner cities and rural villages. As medical technology improves, more procedures will be offered at outpatient care centers for shorter patient stays. Nursing jobs will be most numerous in clinics, medical group practices, ambulatory surgical facilities, and cancer centers. Certain nursing specialties will have more hiring sprees too. Nurses specializing in gerontology, oncology, critical care, genetics, telemetry, neonatal, medical-surgical, psychiatric-mental health, and dialysis will have a promising outlook. Nursing informatics may not be patient-facing, but it’s in high demand for organizing electronic health record (EHR) systems. APRNs who focus in nursing anesthesia, midwifery, and nursing education will also help fill critical shortage areas. Specialty certifications should be pursued through the American Nurses Credentialing Center (ANCC). Even with the strong employment outlook, nurses won’t get hired without proper education. Becoming an LPN requires holding a nursing diploma or associate’s degree in nursing (ADN) from an accredited school. RNs can take the NCLEX-RN exam for licensing after earning an associate’s, but earning a Bachelor of Science in Nursing (BSN) is now recommended. For more advanced roles, APRNs must acquire a Master of Science in Nursing (MSN) in their chosen specialty area. Registered nurses could skip their bachelor’s degree by completing an RN-to-MSN program also. Some nurse practitioners and educators find it beneficial to obtain a Doctor of Nursing Practice (DNP), the field’s highest degree. As the backbone of our nation’s healthcare system, nurses utilize their clinical knowledge and skills to ensure patients receive competent care. Nurses are trained medical professionals who are responsible for safely treating acutely or chronically ill people for the highest chance at recovery. The average yearly salary for RNs in the United States is $69,790, but APRNs earn a six-figure median pay of $102,670. With the great employment outlook for nurses, now is an excellent time for compassionate, resourceful individuals to consider devoting their career to improving patient well-being.